A version of this story was originally posted on this site in late June 2008. But in light of yesterday's story in the Washington Examiner regarding the Obama You Don't Know, it is an appropriate time for its re-telling. Below is the updated story of how State Senator Barack Obama pushed through and protected a housing development deal for Tony Rezko and Valerie Jarret , and how from day-one the housing was a nightmare for its low-income residents. Tony Rezko and Six of his real estate partners were involved in the deal , they all provided tons of cash to Obama's campaign fund. The residents received much less than what they paid for. It was managed by Senior White House Adviser Valerie Jarrett. Her company managed the property as its moved from a low-income housing project to a hell-hole. The name of the development was Grove Parc Plaza, it contained 504 apartments and sat in the district Barack Obama represented for eight years as a State Senator. The federal government subsidized the apartments for people who can't afford to live anywhere else. The problem is that it wasn't safe to live there. 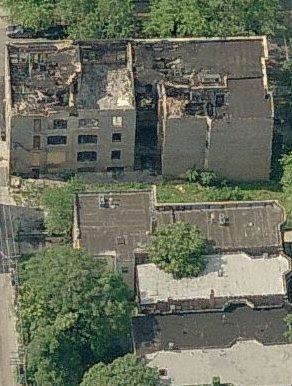 In June of 2008 ninety-nine of the apartments were empty, most of them were totally dilapidated as the result of problems that were never fixed such as collapsed roofs and fire damage. Mice scampered through the halls. Sewage backed up into kitchen sinks. In 2006, federal inspectors graded the condition of the complex an 11 on a 100-point scale - a score so bad the buildings were demolished soon after this investigation was published by the Boston Globe. Grove Parc has become a symbol for some in Chicago of the broader failures of giving public subsidies to private companies to build and manage affordable housing - an approach strongly backed by Obama as the best replacement for public housing. Grove Parc, like Solyndra, like the Small Pox vaccine that doesn't work, like the auto bailout and other prominent failures once he moved to the White House, was the result of crony capitalism. The site was developed and managed by Obama's close friends and political supporters who profited from government subsidies even as many of Obama's constituents suffered. Tenants lost their homes and the surrounding neighborhoods became decrepit. "No one should have to live like this, and no one did anything about it," said Cynthia Ashley, who has lived at Grove Parc since 1994. Obama's campaign, in a written response to Globe questions, affirmed the candidate's support of public-private partnerships as an alternative to public housing, saying that Obama has "consistently fought to make livable, affordable housing in mixed-income neighborhoods available to all." The campaign did not respond to questions about whether Obama was aware of the problems with buildings in his district during his time as a state senator, nor did it comment on the roles played by people connected to the senator. Perhaps they didn't comment because he couldn't blame Bush. Obama worked with an interesting cast of characters on the project. Valerie Jarrett was the chief executive of Habitat Co., which managed Grove Parc Plaza from 2001 until this winter and co-managed an even larger subsidized complex in Chicago that was seized by the federal government in 2006, after city inspectors found over 1,800 violations. Jarret was a big advocate of Obama's policy of She that public-private partnerships are superior to public housing. "Government is just not as good at owning and managing as the private sector because the incentives are not there," said Jarrett, whose company manages more than 23,000 apartments. "I would argue that someone living in a poor neighborhood that isn't 100 percent public housing is by definition better off." Over a decade, Davis’s companies received more than $100 million in subsidies to renovate more than 1,500 Chicago apartments. In some cases he partnered with Tony Rezko. In 1998 they created Neighborhood Rejuvenation Partners LLP. The partnership created New Evergreen/Sedgwick, a $10.7 million renovation of five walk-up buildings in a gentrifying neighborhood that was subsidized by nearly $6 million in state loans and federal tax credits. This was made possible by a $1 million investment provided by the Woods Fund while Obama and Bill Ayers were on the board. (Another big Woods Fund recipient while they served was the Association of Community Organizations for Reform Now, was “ACORN)." Maintenance conditions at New Evergreen/Sedgwick deteriorated rapidly, including plumbing failures that channeled sewage into apartments. New Evergreen/Sedgwick was managed by a company run by Allison Davis’s son, Cullen Davis, also an Obama campaign contributor. Antoin "Tony" Rezko, was the most important fund-raiser for Obama's early political campaigns and a friend who helped the Obamas buy his home in 2005. Rezko's company used subsidies to rehabilitate more than 1,000 apartments, mostly in and around Obama's district, then refused to manage the units, leaving the buildings to decay to the point where many no longer were habitable. Campaign finance records show that six prominent developers - including Jarrett, Davis, and Rezko - collectively contributed more than $175,000 to Obama's campaigns over the last decade and raised hundreds of thousands more from other donors. Rezko alone raised at least $200,000, by Obama's own accounting. The story of Grove Parc begins with Mayor Richard M. Daley, who was elected in 1989. Under Daley the city launched a massive plan to let private companies tear down the projects and build mixed-income communities on the same land. The city also hired private companies to manage the remaining public housing. And it subsidized private companies to create and manage new affordable housing, some of which was used to accommodate tenants displaced from public housing. Chicago's plans drew critics from the start. They asked why the government should pay developers to perform a basic public service - one successfully performed by governments in other cities. And they noted that privately managed projects had a history of deteriorating because guaranteed government rent subsidies left companies with little incentive to spend money on maintenance. "They are rapidly displacing poor people, and these companies are profiting from this displacement," said Matt Ginsberg-Jaeckle of Southside Together Organizing for Power, a community group that seeks to help tenants stay in the same neighborhoods. "The same exact people who ran these places into the ground," the private companies paid to build and manage the city's affordable housing, "now are profiting by redeveloping them." Barack Obama was among the many Chicago residents who shared Daley's conviction that private companies would make better landlords than the Chicago Housing Authority, which is something most conservatives would agree with providing it was free of cronyism. He [Obama]once told the Chicago Tribune that he had briefly considered becoming a developer of affordable housing. But after graduating from Harvard Law School in 1991, he turned down a job with Tony Rezko's development company, Rezmar, choosing instead to work at the civil rights law firm Davis, Miner, Barnhill & Galland, then led by Allison Davis. The firm represented a number of nonprofit companies that were partnering with private developers to build affordable housing with government subsidies. ... In 2001, Obama and a Republican colleague, William Peterson, sponsored a successful bill that increased state subsidies for private developers. The law let developers designated by the state raise up to $26 million a year by selling tax credits to Illinois residents. For each $1 in credits purchased, the buyer was allowed to decrease his taxable income by 50 cents. Obama also cosponsored the original version of a bill creating an annual fund to subsidize rents for extremely low-income tenants, although it did not pass until 2005, after he had left the state Senate. "He was very passionate about the issues," said Julie Dworkin of the Chicago Coalition for the Homeless, who worked with Obama on affordable housing issues. "He was someone we could go to and count on him to be there." The developers gave Obama their financial support. Jarrett, Davis, and Rezko all served on Obama's campaign finance committee when he won a seat in the US Senate in 2004. Obama has continued to support increased subsidies as a presidential candidate, calling for the creation of an Affordable Housing Trust Fund, which could distribute an estimated $500 million a year to developers. The money would be siphoned from the profits of two mortgage companies created and supervised by the federal government, Fannie Mae and Freddie Mac. And we all know that Fannie and Freddie had money to spare?!?!? "I will restore the federal government's commitment to low-income housing," Obama wrote last September in a letter to the Granite State Organizing Project, an umbrella group for several dozen New Hampshire religious, community, and political organizations. He added, "Our nation's low-income families are facing an affordable housing crisis, and it is our responsibility to ensure this crisis does not get worse by ineffective replacement of existing public-housing units." One of the earliest public-private partnerships of the type supported by Daley and Obama took place in the Woodlawn neighborhood, a checkerboard of battered apartment buildings and vacant lots just south of the University of Chicago. Grove Parc Plaza opened there in 1990 as a redevelopment of an older housing complex. The buildings had a new owner and a major renovation funded by the federal government. Even the name Grove Parc Plaza was new. The owner, a local nonprofit company called Woodlawn Preservation and Investment Corp., was led by two of the neighborhood's most powerful ministers, Arthur Brazier and Leon Finney. Obama had relationships with both men. In 1999, he donated $500 of his campaign funds to another of their community groups, The Woodlawn Organization. Woodlawn Preservation hired a private management firm, William Moorehead and Associates, to oversee the complex. In 2001, the company lost that contract and a contract to manage several public housing projects for allegedly failing to do its job. The company's head, William Moorehead, was subsequently convicted of embezzling almost $1 million in management fees. Woodlawn Preservation hired a new property manager, Habitat Co. At the time, the company was headed by its founder, Daniel Levin, also a major contributor to Obama's campaigns. Valerie Jarrett was executive vice president. Residents say the complex deteriorated under Moorehead's management and continued to decline after Habitat took over. A maintenance worker at the complex says money often wasn't even available for steel wool to plug rat holes. But as late as 2003, a routine federal inspection still gave conditions at Grove Parc a score of 82 on a 100-point scale. When inspectors returned in 2005, they found conditions were significantly worse. Inspectors gave the complex a score of 56 and warned that improvements were necessary. They returned the following year and found things had reached a new low. Grove Parc got a score of 11 and a final warning. Three months later, inspectors found there had been insufficient improvements and moved to seize the complex from Woodlawn Preservation. After negotiations with tenants, the government agreed to allow a new company, Preservation of Affordable Housing, a Boston-based firm, to replace Habitat as the manager of Grove Parc. The company is negotiating to buy the development, which would then be demolished and replaced with new housing. The Woodlawn and Habitat (Jarrett) people made excuses for the disrepair. Officials at Woodlawn Preservation say the government didn't give them enough money to properly maintain Grove Parc. Habitat's Jarrett declined to comment on Grove Parc in particular but said it is hard to manage something you don't own. But other Chicago developers and housing activists say federal subsidies can be adequate if managed properly. They say Grove Parc stands apart for how badly it fell into disrepair. In other words the took the money and made the tenants live in squalor. "Grove Parc is quite an exception to what we've normally done because it's in such bad shape," said the nonprofit's chief executive, Amy Anthony. "These complexes are often tired, they're always denser than today's philosophy, but they're not usually anywhere near as deteriorated." Similar problems also plagued the next generation of affordable housing development in Obama's district, created as part of the Daley administration's efforts to subsidize smaller apartment buildings scattered throughout neighborhoods. One of the largest recipients of the subsidies was Rezmar Corp., founded in 1989 by Tony Rezko, who ran a company that sold snacks at city beaches, and Daniel Mahru, who ran a company that sold ice to Rezko. Neither man had development experience. Over the next nine years, Rezmar used more than $87 million in government grants, loans, and tax credits to renovate about 1,000 apartments in 30 Chicago buildings. Companies run by the partners also managed many of the buildings, collecting government rent subsidies. Rezmar collected millions in development fees but fell behind on mortgage payments almost immediately. On its first project, the city government agreed to reduce the company's monthly payments from almost $3,000 to less than $500. "In the winter I can feel the cold air coming through the walls and the sockets," said Anthony Frizzell, 57, who has lived for almost two decades in a Rezmar building on South Greenwood Avenue. "They didn't insulate it or nothing." Sharee Jones, who lives in another former Rezko building one block away, said her apartment was rat-infested for years. "You could hear them under the floor and in the walls, and they didn't do nothing about it," Jones said. If you cannot see video below click here. By the time Rezmar asked Chicago's city government for a loan on its final subsidized development, in 1998, the city's housing commissioner was describing the company in a memo as being in "bad shape." The Daley administration still made the $3.1 million loan. Of course Daley gave them the cash, this was Chicago. Shortly getting the loan, Rezmar switched from subsidized housing to high-end development, using the money it had made on those subsidized housing develpoments. Rezko's companies also stopped managing the subsidized complexes. "Affordable housing run by private companies just doesn't work," Mahru, who no longer works with Rezko, said in an interview with the Globe. "It's difficult, if not impossible, for a private company to maintain affordable housing for low-income tenants." Responsibility for several buildings fell to the Chicago Equity Fund, which had purchased government tax credits from Rezmar to help finance the projects. After Rezko walked away, the fund was obliged to maintain the buildings as affordable housing. If it did not, it would have to repay the government for the tax credits. The fund found the buildings in terrible condition. In a 2001 plea to the state to temporarily suspend payments on its mortgages, a fund executive wrote that heating problems, lapsed maintenance, and uncollected rent made the buildings almost impossible to manage. Most of the buildings have since been foreclosed upon, forcing the tenants to find new housing. All the while, Tony Rezko was forging a close friendship with Barack Obama. When Obama opened his campaign for state Senate in 1995, Rezko's companies gave Obama $2,000 on the first day of fund-raising. Save for a $500 contribution from another lawyer, Obama didn't raise another penny for six weeks. Rezko had essentially seeded the start of Obama's political career. As Obama ascended, Rezko became one of his largest fund-raisers. And in 2005, Rezko and his wife helped the Obamas purchase the house where they now live. Eleven of Rezmar's buildings were located in the district represented by Obama, containing 258 apartments. The building without heat in January 1997, the month Obama entered the state Senate, was in his district. So was Jones's building with rats in the walls and Frizzell's building that lacked insulation. And a redistricting after the 2000 Census added another 350 Rezmar apartments to the area represented by Obama. But Obama has contended that he knew nothing about any problems in Rezmar's buildings. After Rezko's assistance in Obama's home purchase became a campaign issue, at a time when the developer was awaiting trial in an unrelated bribery case, Obama told the Chicago Sun-Times that the deterioration of Rezmar's buildings never came to his attention. He said he would have distanced himself from Rezko if he had known. Other local politicians say they knew of the problems. "I started getting complaints from police officers about particular properties that turned out to be Rezko properties," said Toni Preckwinkle, a Chicago alderman. She had previously received campaign contributions from Rezmar and said she had regarded the company as a model, one of the city's best affordable housing developers. But in the early 2000s, she called Rezko to ask for an explanation for the declining conditions. He told her Rezmar was "getting out of the business," she said - walking away from its responsibility for managing the developments. "I didn't see him nor have anything to do with him after that," she said. Preckwinkle, who [was]will be an Obama delegate at the  Democratic National Convention, said she would not answer any questions about Obama's role in her district, nor his relationship with Rezko. Allison Davis left his law firm to pursue a full-time career as an affordable housing developer, funded by subsidies from the Daley administration and aided, at times, by Obama himself. In several cases, Davis partnered with Tony Rezko. In 1998 the two men created a limited partnership to build an apartment building for seniors on Chicago's South Side. Obama wrote letters on state Senate stationery supporting city and state loans for the project. In 2000 Davis asked the nonprofit Woods Fund of Chicago for a $1 million investment in a new development partnership, Neighborhood Rejuvenation Partners. Obama, a member of the board, voted in favor, helping Davis secure the investment. The following year, Davis assembled another partnership to create New Evergreen/Sedgwick, a $10.7 million renovation of five walk-up buildings in a gentrifying neighborhood. The project, a model of small-scale, mixed-income development, was subsidized by almost $6 million in state loans and federal tax credits. Conditions deteriorated quickly. Chronic plumbing failures consumed the project's financial reserves while leaving undrained sewage in some of the apartments. In October, after repeated complaints from building residents, the city government sued the owners, and a judge imposed a $5,500 fine.